Dana Bowman, one-half of the Attic Investigative Agency’s PIs has been getting nowhere fast trying to find her business partner and fraternal twin Bast Overture who disappeared on Halloween. In particular the police have been giving her the run around. Today she talks to PC Joseph Oliver, the head of Cooks Regional Police Records Bureau. 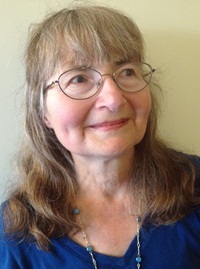 Oliver has helped her in the past with information, particularly in the short stories “Gone Missing” and “Saving Grace” from Beyond the Tripping Point by Sharon A. Crawford (Blue Denim Press, October 2012). P.C. Joseph Oliver sits kitty-corner from Dana Bowman at the head of the table in Thurston Public Library’s boardroom. Dana: Yes, thanks. And there is something you can do. I’m not getting much info from Fielding and Detective Larry Hutchinson who was the lead homicide detective in Susan Stuart’s murder (“Missing in Action” Beyond the Tripping Point), is now avoiding my calls. Oliver: I understand how frustrating it must be. Dana: Okay, if you understand, don’t you agree that as Bast’s twin sister and his partner I should be given updates on the investigation. Oliver: Agreed, but you know the police can’t tell all in their investigation. Dana: Oh, come on, Oliver. Considering our history and particularly your history with Bast when he was a crime reporter, I thought you at least would help. Oliver: All right. I can reveal a bit but you didn’t hear it from me. Dana: My lips are sealed. Oliver: We have been tracing your brother’s financial records, including credit card use, and cell phone use. As you know, his cell phone disappeared with him. Oliver: Well, someone has been using his credit card since Halloween with the last entry so far yesterday as well as ATM hits on his personal banking account. His cell phone, however, has not been used, at least we can find no record of that and our IT experts have been on it since Day 1. Dana: I see. And what and where from are credit card entries showing? Dana: Come on Oliver. I have a right to know. Oliver: Very well, without going into a lot of detail – they seem to be from Toronto and Barrie. Dana: Where in Toronto and Barrie? Oliver: Hmm. Well without going into specifics, mainly department stores, sports stores, computer stores and a few fast food places. Dana: Oliver, Oliver, you need to be more specific. Oliver: Very well, The Bay – both in Toronto and Barrie, McDonald’s and Timmy’s –again in both cities, IT Etc. in Toronto, and Sports Unlimited in Barrie. Dana: What is this person buying? Oliver: Sorry, that I can’t tell you. The fast food places should be obvious and I can tell you that at the IT store one item was a burner cell phone. Dana: Damn. So, you can’t trace the calls. Dana: What about a laptop or iPad? Bast’s laptop and iPad weren’t stolen. In fact his iPad was left in the boardroom. Oliver: Can’t say right now. Dana glares at Oliver: Well, PC Joseph Oliver, what can you say? Can you tell if it is a man or a woman who is using Bast’s credit card? Oliver: Er…not at this point. Dana: What about those ATM hits? Surely their surveillance would show something. Oliver: Can’t tell. But we were planning on letting you view the photos to see if perhaps you had any idea – from the build or even what is seen of the face – who it could be. Dana: And you were going to do this when? Oliver: IT is still trying to get more info with the photo, so then. Dana: Can you give me a date and time? Oliver: A couple of days. Fielding will get back to you. Dana: Thanks. One more question. Is Fielding doing anything about that abstract painting on the far wall. You do know the info about it? Oliver: Yes, I do. And Fielding is looking into it. And that’s all I can say about that for now. Dana: Fine. Just make sure he or you get back to me on it. Oliver nods: And I’ll call you in a day or so to get you to come in to look at the surveillance tapes. Oliver gets up, nods at Dana: Take care, Dana. We’ll find your brother. After Oliver leaves, Dana holds her head in her hands. Dana: Why didn’t they get back to me with the ATM surveillance tapes sooner? And Oliver didn’t give me any timeline for that. Guess I’ll have to speak to Lilly Clark (from “Unfinished Business” in Beyond the Tripping Point) as she lived in both Barrie and Toronto. I’ll have to check Bast’s interview notes with her first. At least they didn’t disappear. You can read more about the characters and their stories in from Beyond the Tripping Point (Blue Denim Press, 2012). Click on the book at the top and it takes you to my profile – including book reviews – at www.amazon.com. The book is available there in print and Kindle. For Kobo e-book go to http://store.kobobooks.com/en-CA/ebook/beyond-the-tripping-point or go to any bricks and mortar store and order in a print copy. Spread the word.